H!P - Hello Non-Pro Hour: So who's the boss? Yamazaki Naoki or Tsunku? So who's the boss? Yamazaki Naoki or Tsunku? I forget when was the last time I wrote a proper essay on this blog. For the past few months, the Hello! Project world has been riddled with gossip, news and scandals, I barely had time to sit down and write. Here's one out from my drafts. Have done extensive research on this one. "Why did Tsunku graduate Nacchi?" "One new member only? What is on Tsunku's head?" Sound familiar? I bet most of us fans of Hello! Project have said something similar at some point. Problem is... Is Tsunku really to be blamed? When Tsunku came out and commented about Kago Ai a couple weeks ago, after hearing his comments and having watched the video streaming news, I felt as if Tsunku is saying that the decision to boot Aibon was not his own. Sure enough, he's a business man, a little poker-face acting has to be done. But was it really? I came to the assumption that Tsunku may not be as influential in the decision making of Hello! Project works as many have thought. Commenter Malmeingehr seems to agree and has supplied a link that he thought "will be of interest" to me. That link was a result of crowd-sourcing work and contained collective links and information of the man which I am going to talk about - Yamazaki Naoki 山﨑直樹. Yamazaki Naoki, born 25th June 1949, is the current Chairman and Representative Director of Up-Front Group Co. Ltd.. I have touched a bit on Up Front Groups, and the functions of related companies, in brief again, is a mother company which has a group companies related to it, such as Up-Front Agency, Up-Front Works and Up-Front Planning. 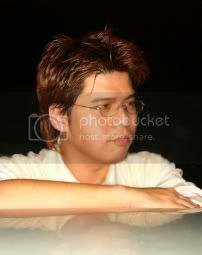 Yamazaki is also one of the Directors of the Japan Visual Industry Guild. He is often compared to the other giants in the entertainment biz such as Max Matsuura of Avex Group Holding and Johnny Kitagawa of Johnny's Office Co. Ltd. However, there are no public information about him anywhere, even photographs of him are scarce and outdated. 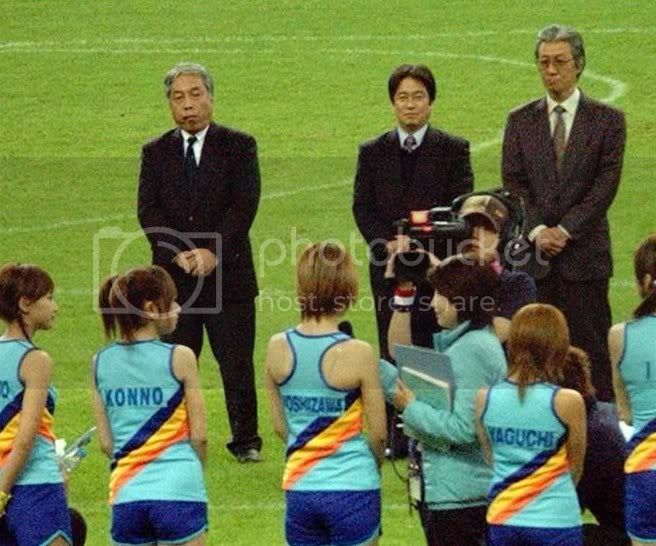 But here's one, from 2004 H!P Sports festival, it's the short gentlemen on the left with white hair. Yamazaki is known to dislike the mass media. Not up to the point that he hates them, but because he has been always unavailable to the mass media for comments. It is his silence that caused the fans to picture him with image of, to quote Dilbert, "the evil pointy-haired boss". Furthermore suggesting that he does not care for the opinions of fans and makes decisions based on his own instincts, despite protests and criticism from fans. The REAL producer of Morning Musume? In an interview with Cyzo, Yamazaki Naoki admitted that initially he wanted to form Morning Musume with around 10 members. But the cost of managing even with 5 members costs 5 million yen per month, and since the potential was still uncertain at that time, the idea was scrapped. He said that he created Morning Musume with reference to an American group that also have members joining and graduating from the band. Furthermore, every graduation and addition of members into Morning Musume will be decided by him beforehand. Looks like Hello! Project was not Tsunku's baby project after all. And even Morning Musume was not Tsunku's idea at all. Clearly, the chairman Yamazaki was behind all decisions within the UFG banner, and Tsunku just produce the music. I must say that it's a bit weird. With all due respect, yes he's the CHAIRMAN of UFG. But doesn't the difference between two different business entities account for anything at all? Can he just cross-over to UFA/UFW anytime and decide on just anything at all? Better yet..... did he have anything to do with Aibon's dismissal? Back to Tsunku... From what I found out, Tsunku took part as producer for Morning Musume because he was into Tokyo Performance Doll(a 90's Japanese Dance-Pop group disbanded on 1996) and was interested in managing a girl group like that. However, it probably turns out that Hello! Project was not what he expected, given the limited creative control he has over the girls. It was not made known to the public about his limitations, but something must have led him into creating his own company TNX, where he has direct control over his own artistes, to go whatever direction he wants. I foresee someday Tsunku breaking away from Hello! Project. But Tsunku himself have said in an interview, that he would hate it if Morning Musume, Berryz Koubou and C-ute songs/lyrics were written by someone else other than him. So I guess he'll stick around for a while. Japanese Wikipedia on Morning Musume. Well...kinda figured this. I wanted to think the suits came in later, tho. Thanks for your research. I still think Tsunku is a genius. It's showbiz, execution is everything. The way graduations are done still seems pretty unique to me, not really like any other group at all. And H!P could get by without his songs, sure, there's successful copycats everywhere already, but I'm interested. He's amazing. Wow thanks for this entry. No doubt Yamazaki carries the corporate clout, and in typical Asian style, tends to stay inside a closet and instead have subordinates like Tsunku take all the blame when they have little input in final corporate product/staffing decisions. Great article, I've always thought Tsunku genuinely cares for the artists he writes songs for, rather it is UFA who cares more about the economic side of things and the portrayal of their company. The article you wrote is great. I've always thought Tsunku probably doesn't have much say in graduating members and such, but I never knew he wasn't really behind the Morning Musume idea. I agree with you that Tsunku most likely made TNX so he could have control over his own artists and how to manage them, etc. I'm not sure how contracts work in UFA, but maybe when those expire, they (MM, BK, and C-ute) will transfer to TNX. Artists can jump labels quite often or angencies. It's just a matter of how loyal they are to Tsunku and if they're unified enough to take such a leep. hehehe well yeah im sure most of us thought alot of this in the back of our minds. anwyay let me get to the point. Amazing job. and i think i agree with everything you said seriously. you definately did your homework. props! Of those five decisions made by the chairman, which of them could Tsunku have done if he felt like it, hypothetically? Tsunku is still a musical genius. And he has done a great job at carrying out all H!P works so far. (Though I do question some of the choice of songs...^_^) Kinda sad that his full potential could not be released, because of God knows how many regulations that limits his ability. End of the day, like RadP said, he has become a fodder for the front lines, taking the blame for whatever dissatisfaction caused due to decisions made by the Chairman, who seem to be more interested in the business side of things, rather than entertainment value. Fortunately, a lot of us knew about the truth, or at least suspects something about it. Interesting that Vyvy brought up the matter of "jumping ship". Stereotypically, the Japanese are loyal workers, but then again it's difficult to say if it ever happens at all. Ahhh, yeah I'm nonjapanese and have got to say this post clears a lot up for me. Great stuff! Yeah you always got that feeling that someone else in the background was pulling the strings on the majority of this all. When I was reading what you wrote, I had like suspensful music playing in my head, as I read things were being answered and I was just like...O_O WOW...!!! Niigaki Risa Internet Meme - "Gaki-san says..."